For over 33 years, families in Georgia have turned to us and trusted us at the most critical times. Call us 912.920.2000 For 33 years, families in Georgia have turned to us and trusted us at the most critical times -- when they have been severely injured or there has been a death in the family. That is when people need our help the most. It is the reason we have limited our practice to serious personal injury and wrongful death claims. To learn more visit www.spivalaw.com VIDEO TRANSCRIPT Waking up in the hospital they waited for a while to tell me that... I lost my leg. They're still trying to put the pieces together for our family. I met Howard and them up to the office and the way they work together is awesome. Nobody thinking that they're better than the next person and... it's just like everybody in here family. Not only did I gain lawyers, I gained family that day. Without their guidance I would have never got any of this done, never. Anybody that's been involved in anything that's not their fault and they're seriously injured, and need the legal help from somebody that will really care about and go the extra mile... I recommend them. “Howard and his team really go out of their way to prepare and present a case!! I was injured in a car accident and Howard really built up my case, one fact at a time, and and presented it to me in a 4″ binder. I was blown away! It was so detailed and drew a perfect picture of what really happened to me in that car at the time of the wreck as well as the injuries that I struggle with every day! “Mr. 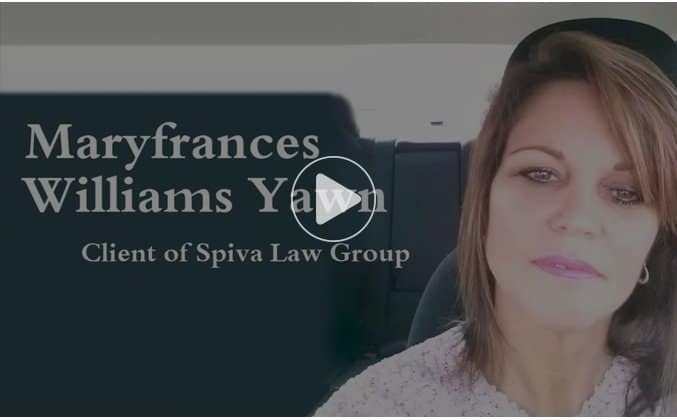 Spiva is an open and honest attorney, providing all the possible outcomes to a client. The positive and negative aspect of the situation are thoroughly discussed in layman’s terms. We never wait days for call backs and are never lost in voice mail hell; he and his staff are cheerfully willing to talk to us, answer questions (sometimes over and over until we understand) and keep us aware on the progress. There are no monetary promises made; but his promise to give you the best possible representation available is a promise you can take to the bank.